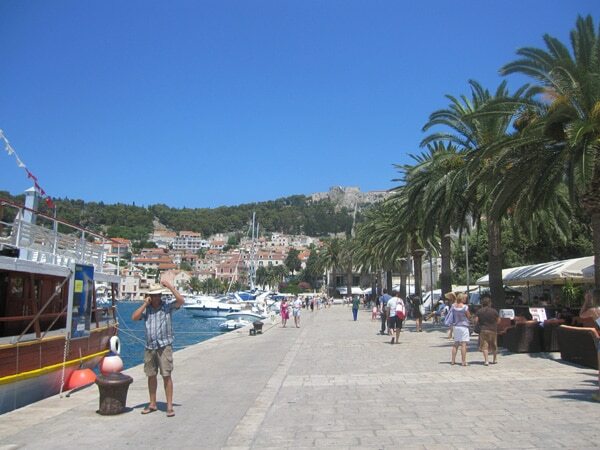 From Split it takes 1 hour by fast boat to reach the town of Hvar. 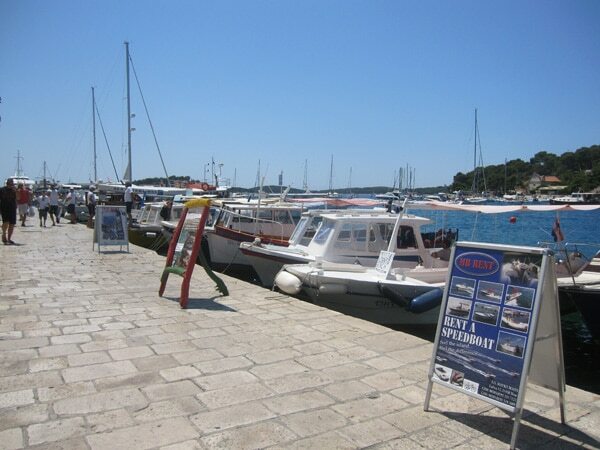 But since we are going by car we will have to take the ferry to Stari Grad, that will take us 2 hours. 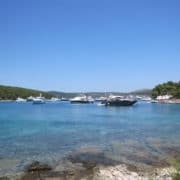 In this beginning of July, like every year, Split is crowded with tourists coming to the town to take the boat and head towards the islands of Korčula, Hvar, Vis and Brač. 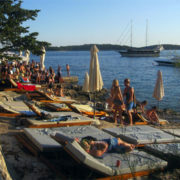 Hvar is known as one of the best places to party in Croatia. 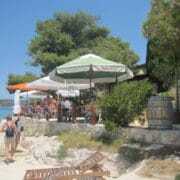 Every summer people from all over the world come to party in this village with Dalmatian charm. Talking about ferries, Saturday is the busiest day of the week since it is the day of arrival and departure of tourist. Today is Saturday, this morning 25 cars remained on the harbor while the ferry from 11:30 am was leaving Split and they had to wait for the next ferry. Actually it is not possible to buy a ticket for a special ferry. The ticket you buy allows you to take any ferry that day. That’s why it is compulsary in July-August to park the car in front of the ferry at least 2 hours before departure if you want to make sure to get on it. As far as we are concerned, we take the ferry from 2:30 pm to arrive at 4:30 pm on the island. We are lucky to live only 5 minutes by walk from the harbor so we park the car at 12.30 am and we will be back 45 minutes before departure when the cars will get on the ferry. 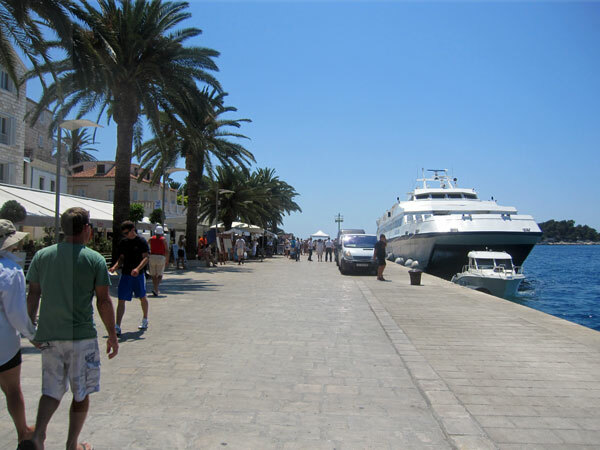 Since the ferries leave from the harbour situated on the old town of Split, you can buy your ticket at the office of Jadrolinija the Croatian ferry company, then park your car 2 hours before departure and have a walk in the old town. You’ll just have to be back 45 minutes before departure. 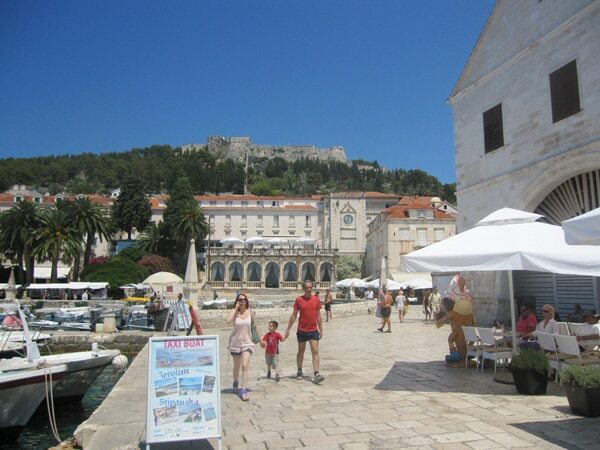 The one-way ticket to Stari Grad will cost us 300 kn (about 40 €) for the car and 47 kn (about 7 €) per person. 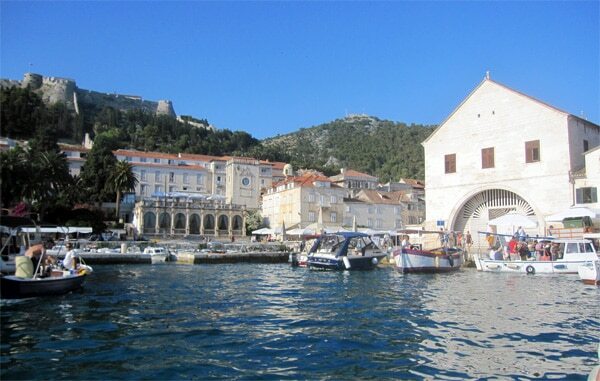 You cannot buy a round-trip ticket but you will have to buy the return ticket in Stari Grad before departure. 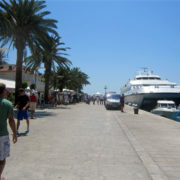 When arriving on the island, there are buses going to the main villages on the island: Jelsa, Stari Grad and Hvar. There are also taxis but of course the bus is cheaper. 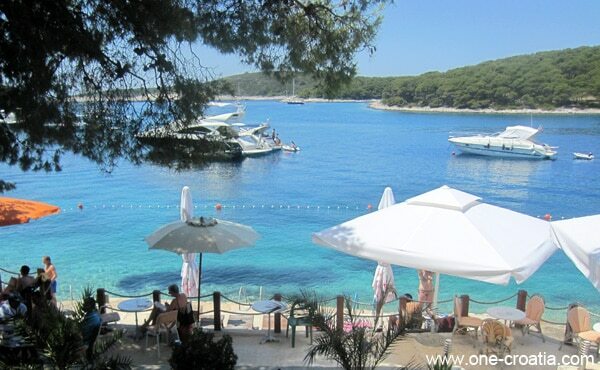 Hvar is situated only 15-20 minutes away by car. Considering accommodation, you’ll have the choice from 2 to 5 stars hotels or you can rent an apartment or just a room from private accommodation. We will spend the night at a friend’s house so no need for us to look for an accommodation. This weekend in the beginning of July is the hottest we had so far this year, nothing to compare with the heat of June, we exceed 35 C in the shade. 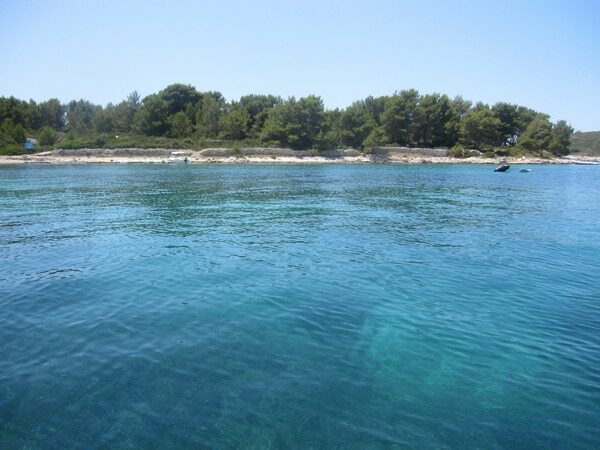 So first thing when arriving in Hvar is to go to the nearest beach. Since there are only pebble beaches on the island it is better to rent deck chairs that you will find on every single beach. The price is 20 kn (about 3 €) per day. 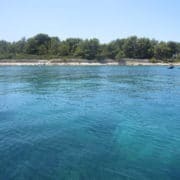 The sea water is so warm, about 25 C… It is so clear that you can have a great time diving with just a mask and a snorkel. Apart from the usual sea urchins, shellfishes and small fishes we saw an octopus very close to the beach, at only 3 meters deep. Lying on our deck chair we can hear the music of the Hula-Hula bar which is one of the most famous bars at the moment for the after beach parties. 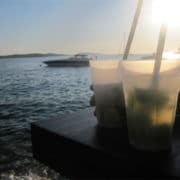 After the beach we join the crowd that dances on the music of the DJ and we drink a Mojito by the sea. 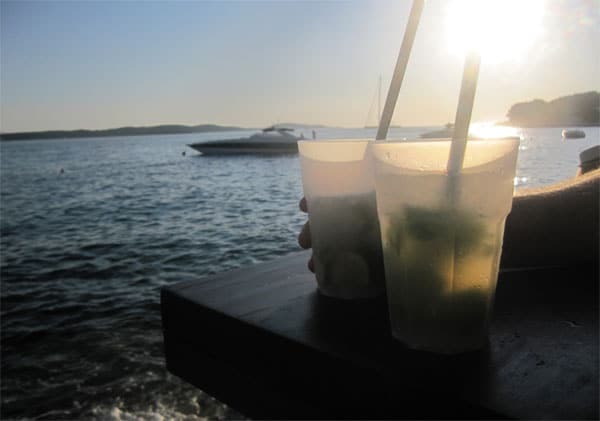 The price of a cocktail in Hvar is from 5 to 10 €. The price depends of the bar, at Hula-Hula we paid 62 kn (about 8 €) per cocktail. But bars offer as well much cheaper drinks like beers for about 3 euros. 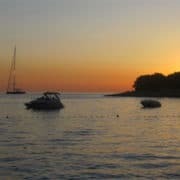 When the sun is slowly going down around 6:00 – 7:00 pm and we join all these people from all over the world to party on the beach, this unique view over the crystal clear sea, the islands and yachts in the bay, then we can surely say that Hvar is the best destination to party in Croatia. We have been waiting for the sunset at 8:00 pm and then we met our friends for dinner in town. 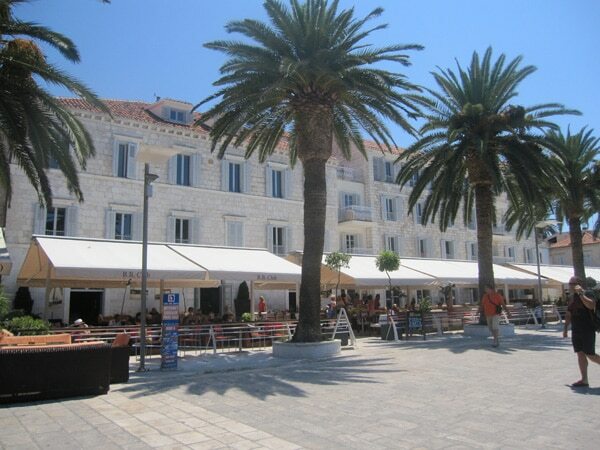 There are many restaurants in Hvar for every taste, budget and style. We will have dinner at Lucullus, this restaurant is situated in the narrow streets of the old town. We had a glass of Freixenet to start, then shells, fish in the oven with vegetables and potatoes, and two bottles of Pošip white wine. The bill was 1,800 kn (about 250 €) for the four of us. Be aware that fish is quite expensive in restaurants, even if it is just grilled you may be surprised by the price. After dinner there are so many places where you can have a drink. 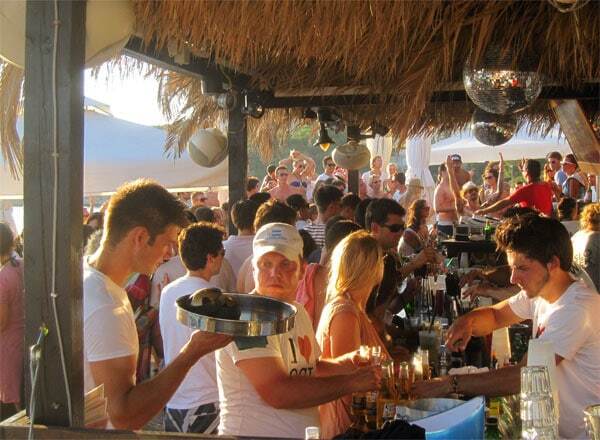 Like Carpe Diem bar which is one of the reason why Hvar became a party place, or the outdoor disco Veneranda. 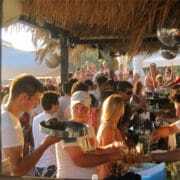 We will have a drink in the bar Nautika which is situated on the harbor in the old town, we will dance at the edge of the water until closing at 2:30 am. On Sunday morning we will have coffee in town at the terrace of the Hotel Riva. Depending on the bar you will choose, expect to pay from 1 to 2 € for a coffee, from 1,30 to 3 € for a cappuccino. 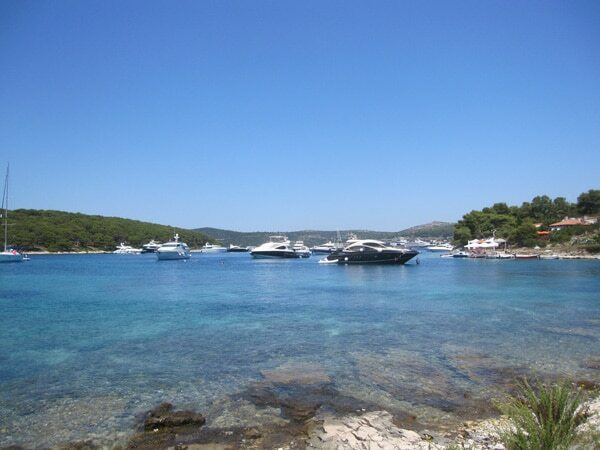 At 1:00 pm we take a boat to the Pakleni Islands. Boats are situated next to the main square. The round trip costs 35 kn (about 5 €) per person and the crossing lasts 15 minutes. 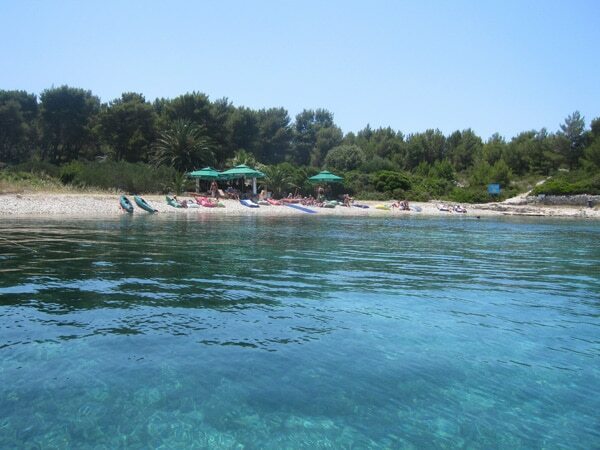 On these islands you’ll find so many bays to spend the day. We are going to Ždrilca bay. There are many yachts moored in the bay. 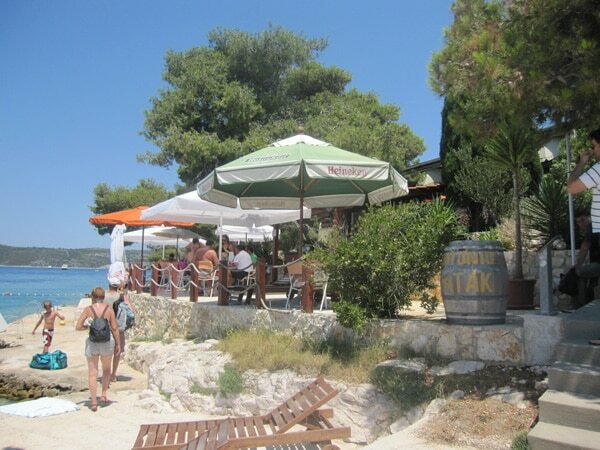 We will have lunch at the Antonio Patak’s restaurant situated a few meters from the place where we left the boat. The propose a typical Croatian menu with octopus salad, pasta and risottos, squids, langoustines, meat and grilled fish. Expect to pay about 8 – 10 euros for a main course. The last boat is leaving the island at 6:00 pm, that gives us enough time to enjoy the beach. 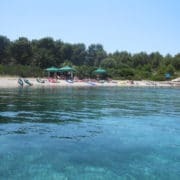 There is a pebble beach just next to the place where the boat left us, and rocks as well where you’ll get more privacy. If you go on the right when leaving the boat then you will arrive at a beach of rocks reserved for nudism. 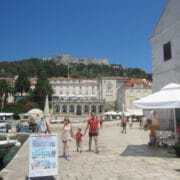 We are back in Hvar at 6:15 pm, a last drink in town and we arrive at Stari Grad at 7:00 pm to take the ferry at 8:00 pm. It is not crowded, actually it will be only half full. 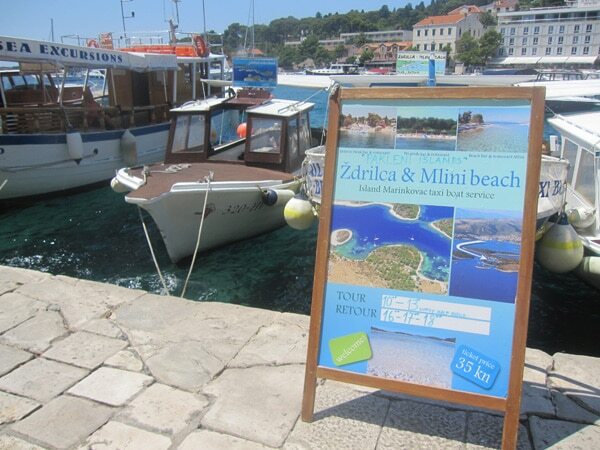 Tickets must be purchased at the office of the Croatian ferry company Jadrolinija in front of the ferry. We still have some time to do some shopping for dinner at the supermarket just across the harbor.